How is the PSN kerfuffle affecting developers who make downloadable games for the service? Despite an incredibly insignificant silver lining, there's no question that Sony's PSN disaster is one hell of a debacle. But while the outage - and related problems - are causing headache for consumers, what about the indie studios who make a living selling downloadable games over PSN? "Well, the outage has certainly affected our sales," Creat Studios' Bill Fryer told Gamasutra, "[But] we are supportive of Sony and hopeful that this extended maintenance will lead to a more secure network altogether." Creat's Test Yourself, released March 8th, was one of the top 5 downloadable games on PSN at the time of the service outage. Beyond sales, said Fryer, the outage means that PS3 users aren't seeing banners or ads, so the company (and its game) has lost visibility and mindshare in addition to sales lost. Alexey Menshikov, CEO of Kiev-based Beatshapers, was slightly more confident in his studio's stability given that the game most affected - StarDrone, which released in early April - wasn't the company's only product on sale. Still, while he doubted any "permanent damage" would happen to the studio, he admitted Beatshapers was feeling the loss of a week's sales. "This is a sad situation." He hopes that Sony would recompense developers in some way when service was restored, perhaps in the form of decreased royalties on sales. Of all the companies who make games on PSN, PopCap is almost surely one of the most stable - after all, it makes a ton of wildly popular games on a ton of varied platforms. 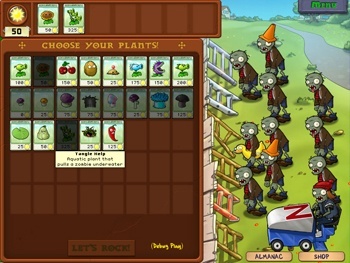 Like Test Yourself PopCap's Plants vs. Zombies, which we here at The Escapist adore, was one of the top five downloadable games on PSN at the time everything went kaput. "We're rooting for Sony to resolve the issue as quickly as possible," a PopCap rep told Gamasutra. "PSN is one of our primary channels for reaching console game fans, and it does feel as though Sony should compensate customers, if not developers, for the outage." I think most consumers would probably agree with PopCap there.